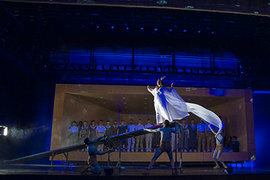 The Ithaca College School of Music and the Department of Theatre Arts offer several opportunities for students to get involved in opera on campus, whether you have a mild interest or are a full-fledged opera lover. This past spring, IC students performed Handel’s Semele, an opera about a woman who wanted to become a goddess. The modern interpretation of the racy opera featured Bacchus (the god of wine) wearing a garland made of red solo cups.